Stair Creek Conservancy protects Stair Creek watershed and contains steep, southeast facing forests, which provide a good example of productive old-growth forests containing yellow cedar, red cedar and hemlock trees. The ground rises steeply from the north side of Douglas Channel in a series of relatively nutrient-rich hills made of folded and banded/layered metamorphic bedrock (schist and gneiss) which can be seen along the shoreline. Stair Creek, which runs through the middle of the conservancy, has waterfalls and is not accessible by boats. There are no roads or trails in this wilderness area. There are no facilities in the conservancy. Please note: Any maps listed are for information only – they may not represent legal boundaries and should not be used for navigation. 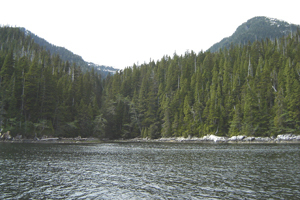 Stair Creek Conservancy is only accessible by boat and is located 45 km southwest of Kitimat and 35 km northeast of Hartley Bay. It is located on the north side of Douglas Channel and is bordered to the east and north with Foch-Gilttoyees Park. Reference: Marine Chart #3743 (Douglas Channel). Reference: 1:50,000 scale Topographic Map #103 H/11 (Kitkiata Inlet). Any maps listed are for information only - they may not represent legal boundaries and should not be used for navigation. Stair Creek Conservancy was designated as a conservancy on May 31, 2007 following recommendations from the North Coast Land and Resource Management Plan. The conservancy is in the asserted traditional territories of the Haisla, Gitga’at and Gitxaala First Nations. Use the below links for more information or to contact these First Nations. Gitxaala First Nation: No website at this time. The conservancy protects the undisturbed old-growth forests and watershed of Stair Creek. Online Management planning information for this conservancy is not available at this time. Adventurous and experienced kayakers may enjoy exploring the shorelines in this conservancy. There may be opportunities for fishing in Stair Creek. Please consult the appropriate non-tidal fishing regulations for more information. Anyone fishing or angling in British Columbia must have an appropriate license. This conservancy is open to hunting during lawful hunting seasons. Please check the BC Hunting and Trapping Regulations for more information. Swimming is possible in the ocean, but the water is cold all year-round. There are no lifeguards on duty in the conservancy. Firewood is not provided. If you must have a fire, please burn only dead and down wood, and be sure to fully extinguish the fire when done. Dead wood is an important habitat element for many plants and animals and it adds organic matter to the soil so please use it conservatively, if at all. We encourage visitors to conserve wood and protect the environment by minimizing the use of campfires and using camp stoves instead. Limited burning hours or campfire bans may be implemented during extremely hot weather conditions. Wilderness, backcountry or walk-in camping is allowed, but no facilities are provided. All sites are on a first-come, first-served basis. There are winter camping opportunities in this conservancy, as it can be accessed year-round.